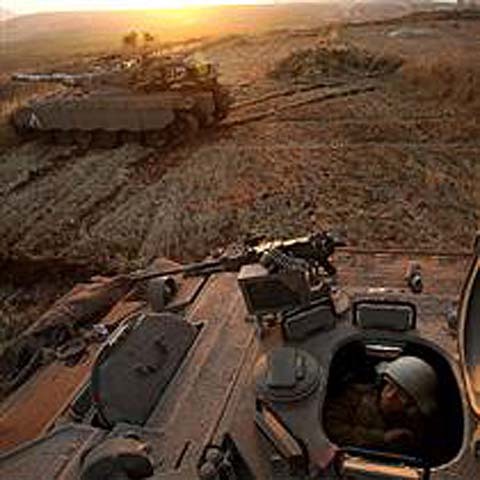 Michael Gordon, chief military correspondent for The New York Times, was recently the guest on Fresh Air. He gave an amazing and engaging run down of his understanding of the Iraq conflict after having been embedded there since the 2003 invasion. He openly talks about the difficulties of recruiting Iraq military forces, Sadam’s reasoning for lying about WMD’s, Rumsfeld’s famous “No Nation Building” speech and the White House’s redefining of the word “victory” in regards to our involvement there. Amazing stuff from someone who’s been with this thing from the very beginning. 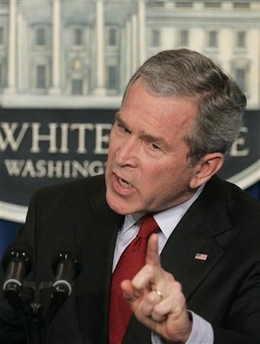 At an unscheduled news conference in the Brady Briefing Room of the White House, Tuesday, March 21, 2006 in Washington, Bush said there will be ‘more tough fighting ahead’ in Iraq, but denied claims that the nation is in the grips of a civil war three years after the U.S.-led invasion. 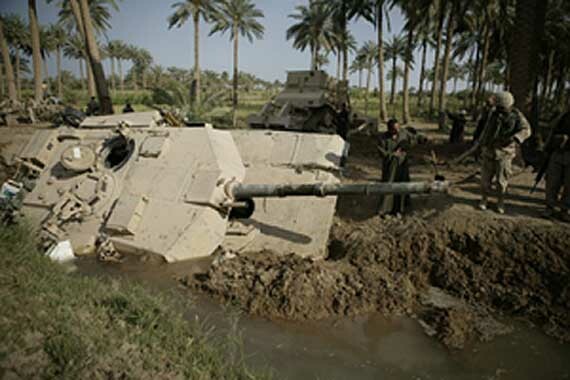 Bush suggested that US troops will be in Iraq at least until 2009 and said he would only withdraw them if he thought the situation there were hopeless. 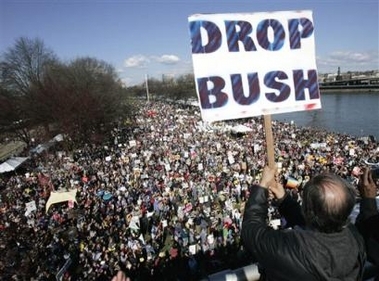 Meanwhile, over the weekend and into Monday, the three-year anniversary of the Iraq occupation launched a massive global march by anti-war protestors. 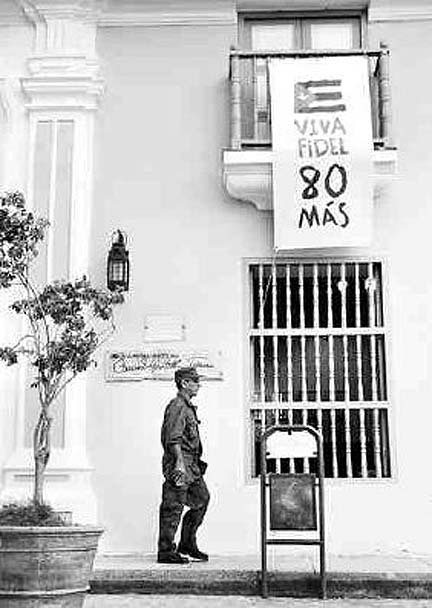 Here are some of the more memorable images I’ve found from the historical event. 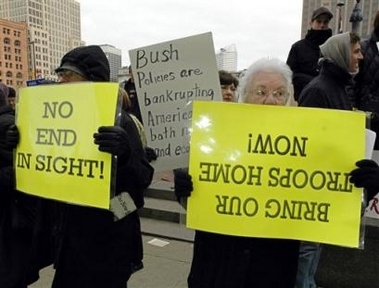 Madeline O’Brien, right, joins a protest outside a Cleveland hotel where President Bush delivered a speech on the war on terrorism Monday, March 20. A protester is arrested on Monday in Washington. 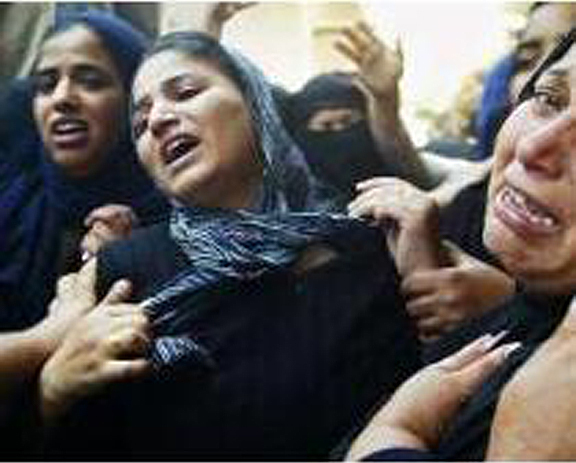 Invoking startlingly relevent imagery. 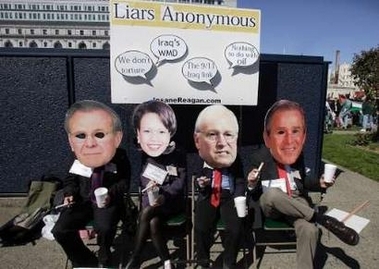 The marchers tried to deliver a mock coffin to Defense Secretary Donald H. Rumsfeld, but police kept them off Pentagon grounds. 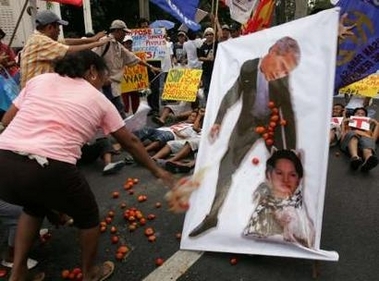 A Filipino anti-war protester pelts a poster of George W. Bush and Philippine President Gloria Macapagal Arroyo with tomatoes during a rally near the U.S. embassy in Manila. 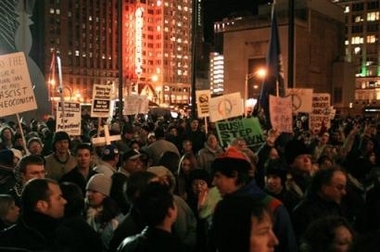 Thousands of Iraq war protestors gather in downtown Portland, Ore., Sunday, March 19. Demonstrators carry flag-draped mock coffins onto the steps of Puerto Rico’s Capitol building, during a protest against the war in Iraq in San Juan, Puerto Rico, Sunday. 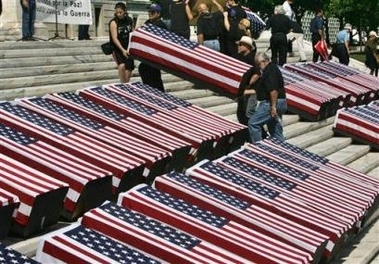 The coffins were meant to represent the Puerto Ricans who have fought and died as part of U.S. forces in Iraq. 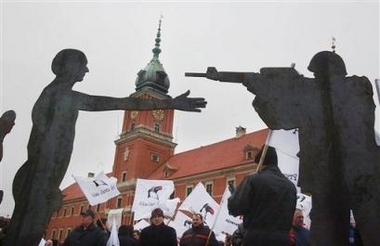 Anti-war protesters gather beneath metal figures of soldiers and war victims at the start of a march in protest of the Iraq war in the Old Town in Warsaw, Poland, on Sunday. Some 1000 protesters walked downtown to the Presidential Palace, the U.S. Embassy and the office of Prime Minister Kazimierz Marcinkiewicz, demanding that Poland pull out its troops from Iraq. Anti-war demonstrators kiss during a protest in central Madrid. 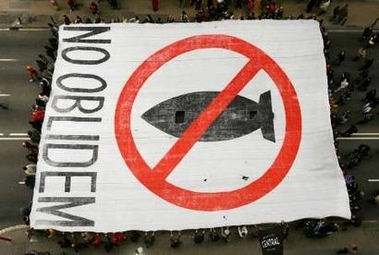 Banner reads ‘Nuclear disarmament in Iran and global’. More from central Madrid, Sunday. 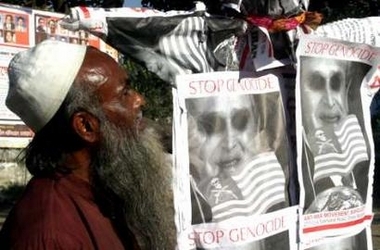 A Bangladeshi man looks at posters with caricatured portraits of George W. Bush during a protest in Dhaka on Sunday. 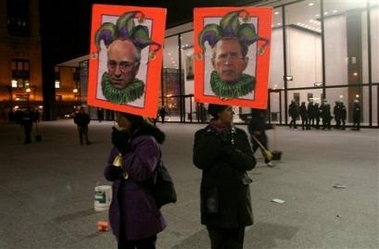 Maryann Lewis, left, and Barbara Wood carry signs at the end of an anti-war protest at Daley Plaza, Saturday, in Chicago. 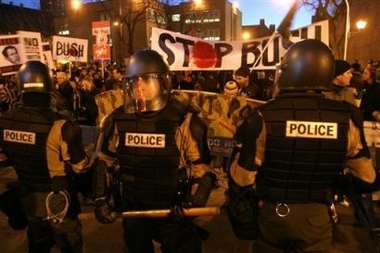 Illinois State Police Officers dressed in riot gear stand in front of demonstrators in Chicago. Mexican protester stands outside the U.S. embassy in Mexico City on Saturday. 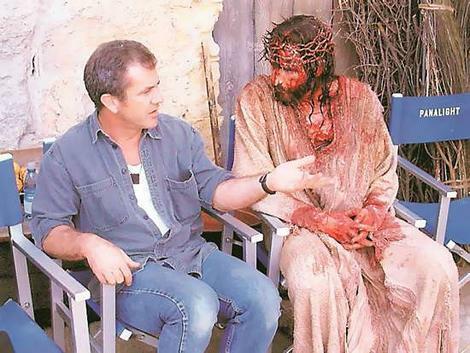 The writing on his body reads ‘Bush Murders’. 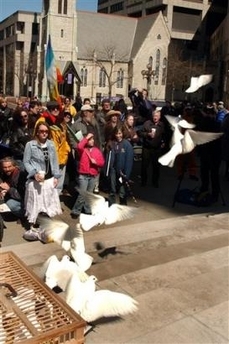 White doves are released on Monument Circle in Indianapolis on Saturday. By Monday the doves were all devoured by the carion birds in the immediate area (joke). Carlos Arredondo holds up a photo of his son Marine Lance Cpl. Alex Arredondo on Saturday, in the Roxbury neighborhood of Boston. 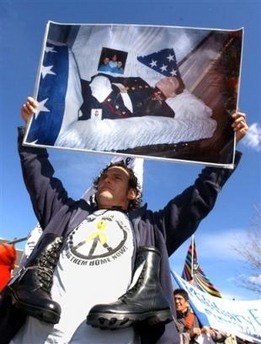 Arredondo was killed in Iraq in 2004. 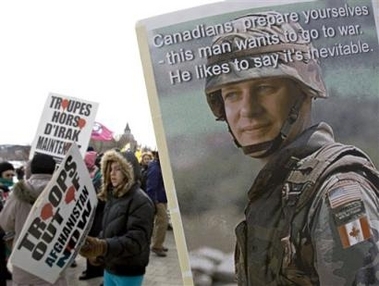 A poster showing Canadian Prime Minister Stephen Harper in army fatigues is carried by a demonstrator in Ottawa, Canada, Saturday. 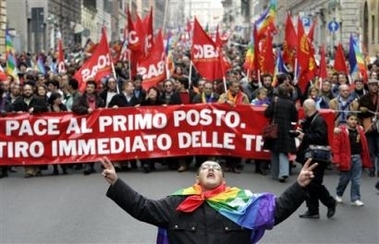 Rome, Saturday. The banner in background reads, ‘First thing peace, troops withdrawal now’. 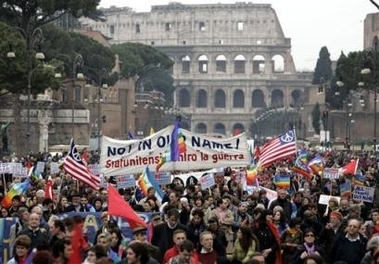 Rome, Saturday. The banner in backgorund reads, Not in our name. 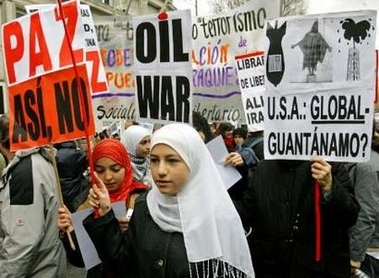 U.S. Citizens against the war. 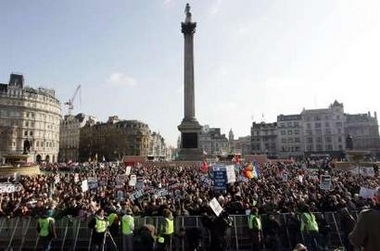 Thousands of protesters take part in Trafalgar Square in central London. At least 14,000 marched through London on Saturday. 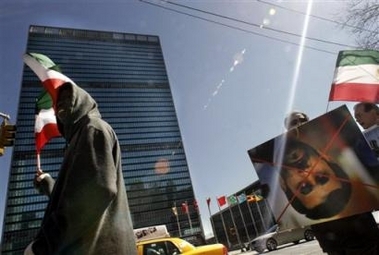 Protesters carry a picture upside down of Iran’s President Mahmoud Ahmadinejad and wave the country’s flag as they demonstrate outside the United Nations in New York on Friday. The Iranian Community of New York members and their supporters chanted ‘no war, no appeasement, democratic change by resistance,’ as they rally in protest against the Iranian government, calling on the United Nations Security Council to impose immediate sanctions against the Iranian regime. 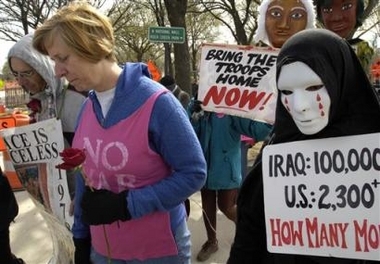 Peace activist Cindy Sheehan, left, and Anna White of Washington, march to the Pentagon to protest the war in Iraq on Monday. Iraq War supporter Danielle Ballard expresses her opposition to a nearby anti-war protest in Reno, Nev. on Sunday. 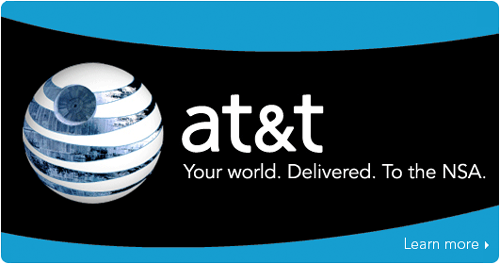 As you may already know, the ELECTRONIC FRONTIER FOUNDATION has filed a class-action lawsuit against AT&T, accusing the telecom giant of violating the law and the privacy of its customers by collaborating with the National Security Agency (NSA) in its massive and, as far as anyone can tell, illegal domestic spying program to wiretap and data-mine Americans’ communications. For the full low down on the Electronic Frontier Foundation’s lawsuit go here. But wait, that’s not all… a new whistleblower who says millions of Americans have been spied on, not just thousands, has emerged!! So there you go! Freedom is on the march!! Menwith Hill US base near Harrogate, is run by the NSA. Inside ‘hardened’ buildings, the staff tap into all telecommunications traffic to and from Europe that pass through Britain. It is not marked on any map. It is the most secret US base in Britain and the world’s largest spy base. It is the hub of US military planning in the northern hemisphere. Yorkshire CND together with the Otley Peace Action group have waged a long campaign to close down the base and to exercise their right to walk on this stretch of British moorland. 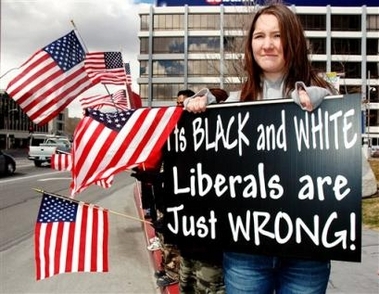 If Americans have been fine with this for decades, what’s the big deal when it comes to domestic spying? What are the ethics of spying and when is the line crossed? Was it crossed when the National Security Agency Web Threat Algorithm Program went online and began scanning millions of innocent websites around the clock? That was made legal under the PATRIOT ACT, but is it ethical? Are we unsafe without it? These are all pertinent questions that stretch out far beyond the systemic legalities of this issue. 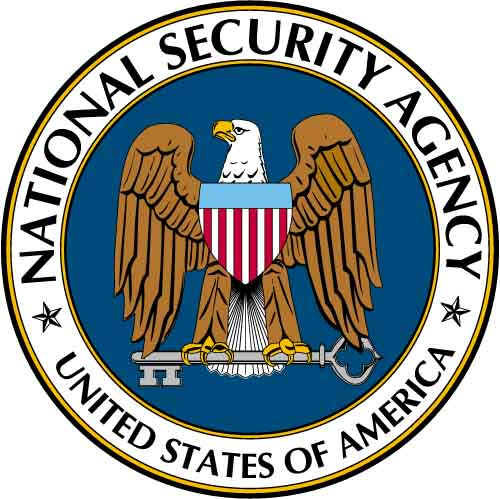 NSA… YOU HOLD THE KEY TO MY HEART!